Some of the better-protected roadsides and bush remnants around the Valley of a Thousand Hills are currently displaying a range of indigenous lilies in flower. While these are showy and eye-catching, there is another group of plants also flowering that generally goes unnoticed – our native grasses. Grass flowers lack petals, but the exposed reproductive parts (anthers and stigmas) can be colourful and attractive in a more subtle way. 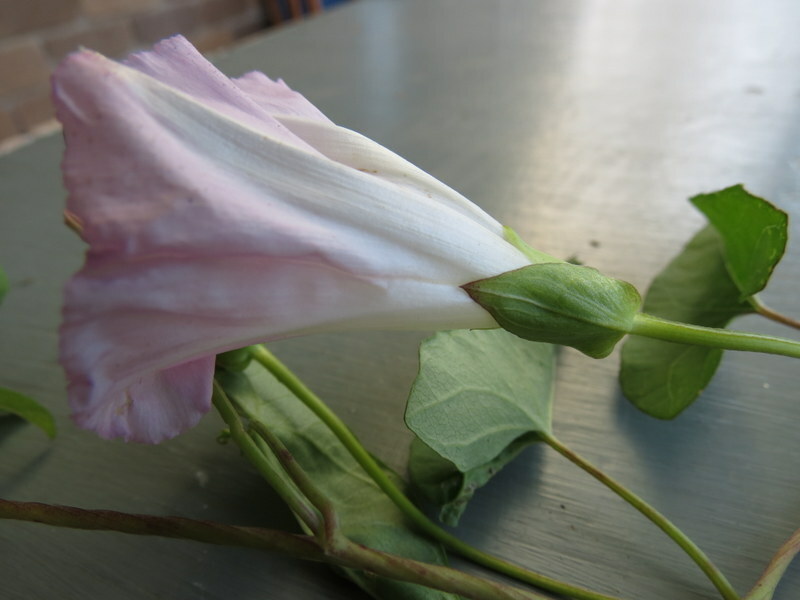 But you need to keep a close watch as the period of flowering (anthesis), when pollination occurs, is short, perhaps just a few hours. … is a famous line from the movie Poltergeist II, in which a young girl answering her toy phone in the middle of the night declares the evil spirits have returned. Then the action really gets spooky. Yesterday, the line represented something completely different. Last year we discovered to our complete surprise two populations of Clover Glycine (Glycine latrobeana) flowering on our property. Surprise, because the plant is listed as Vulnerable under the Commonwealth Environment Protection and Biodiversity Conservation Act 1999. 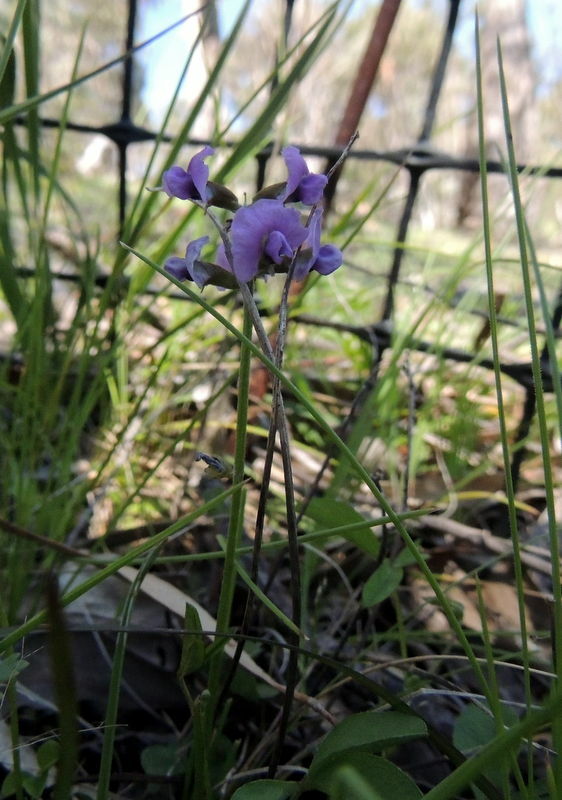 According to the Victoria Biodiversity Atlas, ours is the first record of this plant in the Murrindindi Shire and one of only ten sightings in the Goulburn–Broken Catchment. We fenced off the area surrounding the plants with chook wire, and because of work commitments we missed the opportunity to collect the seed. For the last 12 months there has been an anxious wait to see if the plants would flower again. Yesterday a yell of ‘They’re back’ echoed around the hills. The Clover Glycine on one of the northern slopes is in full flower, and the plants on a more shaded eastern slope are healthy but not flowering yet. The next task is going to be trying to collect the seed. I plan to sleep outdoors just so I don’t miss the event (shades of queueing for KISS tickets a long, long time ago!). 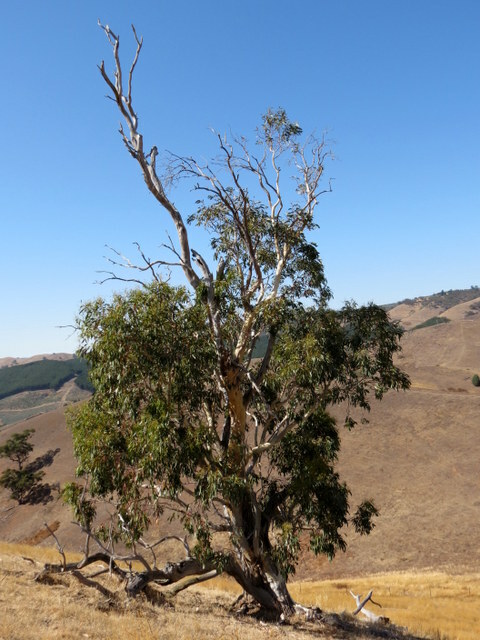 Back in the 1990s we noticed a group of three unusual-looking low spreading white-trunked trees, high on a steep ridge overlooking our property near Strath Creek. From a distance we assumed they were stunted Candlebarks (Eucalyptus rubida), although it seemed an unlikely spot for them to be growing. On closer inspection they were clearly not Candlebarks, so we took samples of leaves, buds and fruit, and back home we very tentatively identified them as Snow Gums or White Sallee (Eucalyptus pauciflora ssp. 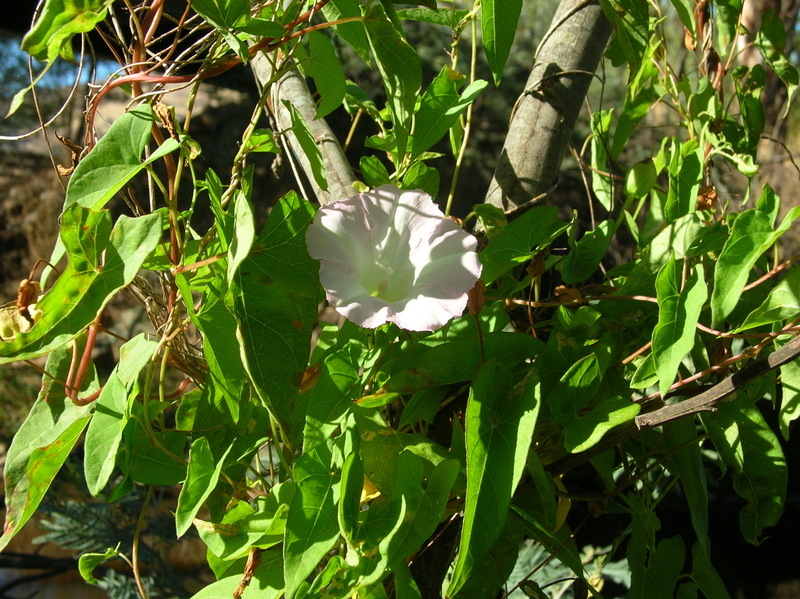 pauciflora). 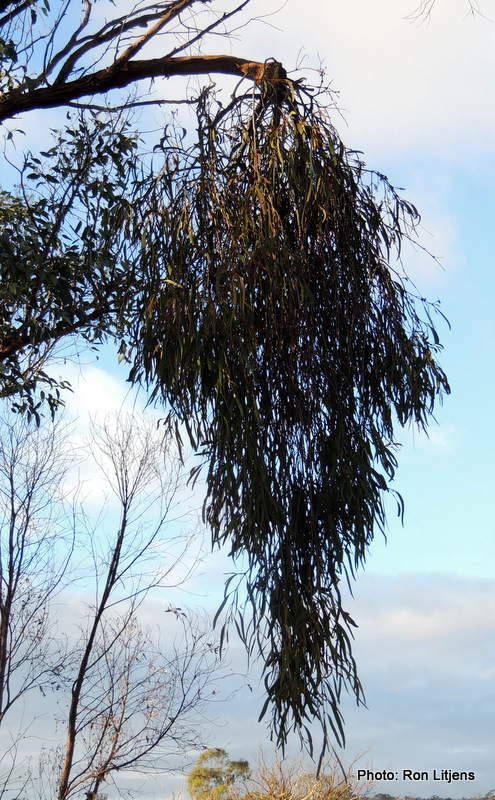 This was later confirmed by a DSE botanist, who explained that, as well as in the mountains of eastern Victoria, isolated remnants of these trees can be found right across central and western Victoria to the South Australian border, and in lowland areas such as the Yarra Valley and even the Mornington Peninsula. 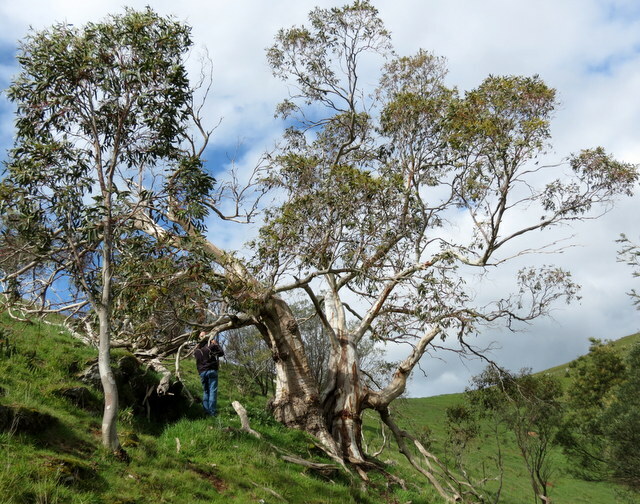 In February 1998 some members of the Strath Creek Landcare Group visited the site and discovered that not only were the three gnarled old trees being knocked around by cattle, but there were several small progeny of the trees nearby that had large lignotubers (woody swellings at the base of the trunk containing food reserves and dormant buds), indicating that they were being repeatedly browsed by sheep and cattle, not to mention the wild goats that roamed the hills. 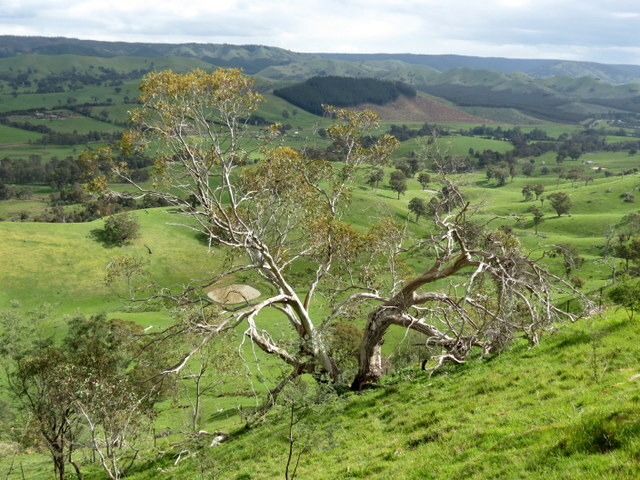 So the Landcare group decided to protect the area, and in May 1998 an intrepid band of members fenced off about half an acre around the trees on the challenging steep rocky site. Ancient and on the way out? 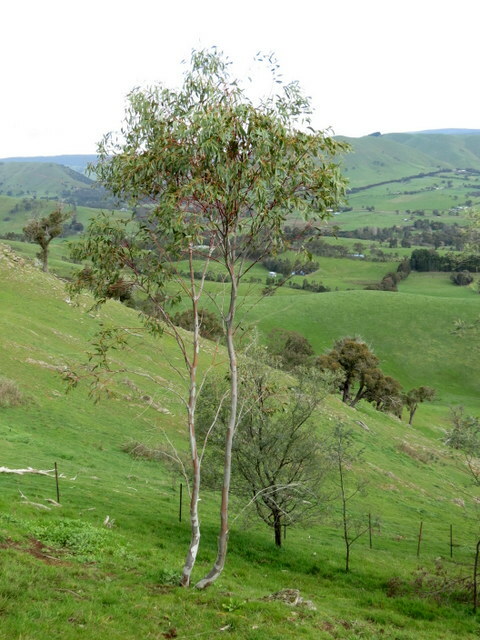 Now, sixteen years later, the fence is sound, the three old trees are still alive, although one is looking worse for wear, and the good news is that there are at least fifteen healthy young Snow Gum sapling growing in the protected area alongside Silver Wattles (Acacia dealbata) and a Blackwood (Acacia melanoxylon). 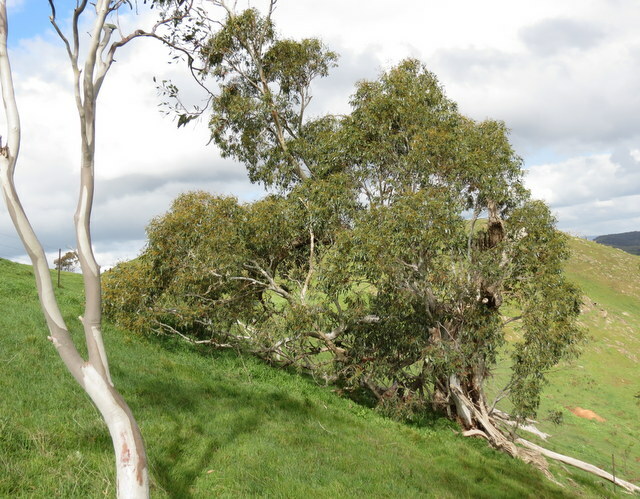 We have subsequently learnt of at least 2 other Snow Gums growing in the Strath Creek area – one at the western end of the Yea Spur, and the other off Allandale Road. Fortunately both of these sites are now protected under the Strath Creek Biodiversity Project, and hopefully will be able to regenerate naturally. A local botanist has suggested that some of these trees, with their massive lignotubers, could be very old indeed, perhaps many hundreds of years – but we’re not about to cut one down to count the growth rings ! I recently was sent this photo from Shaunna and Chris in the Strath Creek valley and even though it is a couple of months old it is worth sharing. If you look carefully there is a large circular arrangement of mushrooms in the middle of their paddock. Mushrooms are the fruit of a fungus (analogous to an apple and an apple tree). When the mushroom disappears the fungus is still growing, in this case underground, as a network of mycelia. A single fungus grows from a single point. In areas where there is no interruption by rocks or plants, the mycelia will grow out from the centre in a radial pattern and in fruiting season, the mushrooms will develop at the outer edge of the mycelia, hence forming the classic ‘fairy-ring’. Where did you pop up from? For the past decade I have been scouring our block looking for new things to find. I think I’ve found most of the ‘big things’, so then I look for smaller and smaller things—hence recent blogs on tiny springtails and fungi. Sometimes though, nature throws up a surprise. 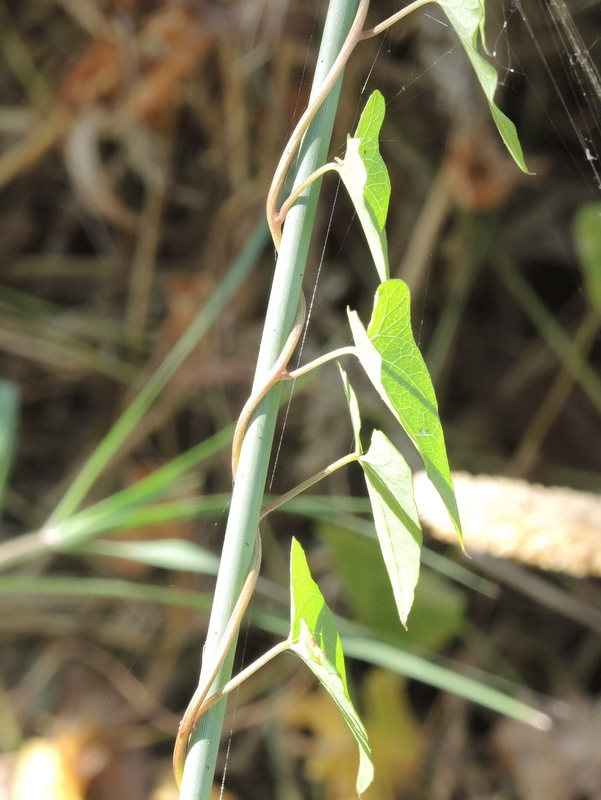 Last week I found not one but four Ploughshare Wattles (Acacia gunnii) all huddled close together. 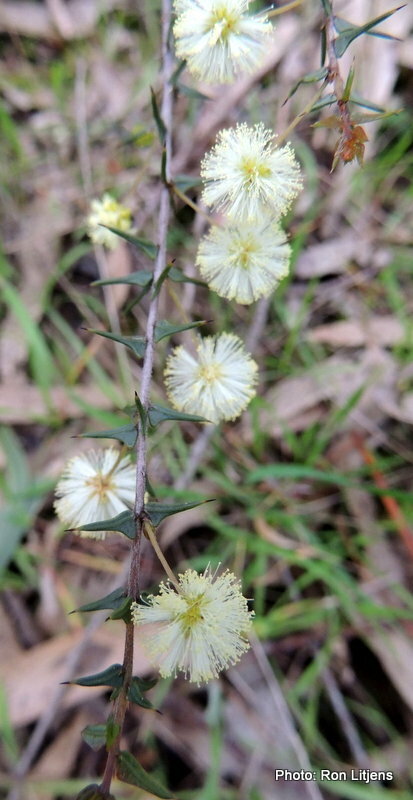 This wattle is known in the district though is not very common. 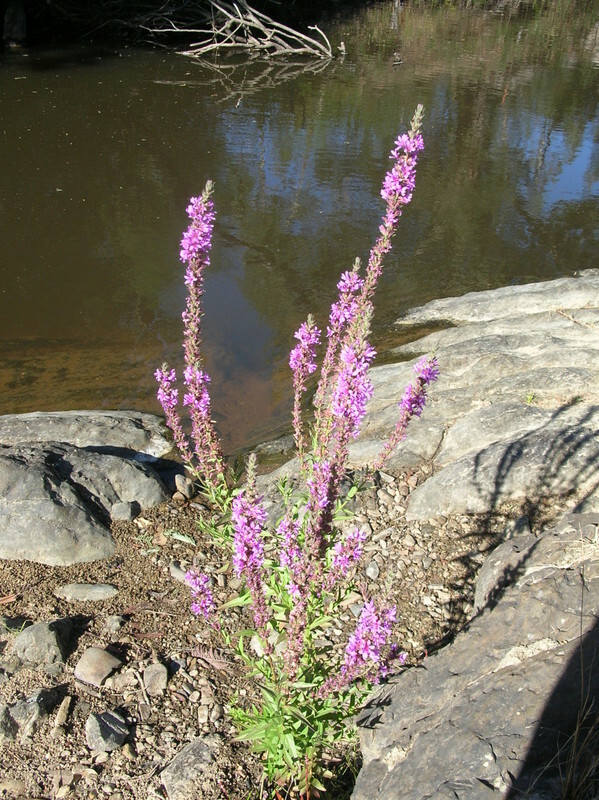 The plants were in a location that I often walk past and if they had not been flowering I would not have noticed them. Up on the roadside another not so common wattle is also now conspicuous by its flowering. Snake Wattle (Acacia aculeatissima) is a prostrate form of wattle. Before this year, I had only known of one plant in the roadside reserve. So far this year I have located six of them. Up on our hill, both plants are prostrate bushes that seldom get higher than half a metre. They both fix nitrogen in the soil. Given the lack of soil on our property, there must be a whole lot of nitrogen looking around for a place to live. Not much is flowering at the moment. Some of the purple Fabaceae are starting to make their move (Common Hovea, Austral Indigo, Native Sarsparella) and on our hill the Drooping Mistletoe (Amyema pendulais) is looking stunning (see picture left). Mistletoe is the common name applied to a group of parasitic plants that attach themselves to trees and shrubs. 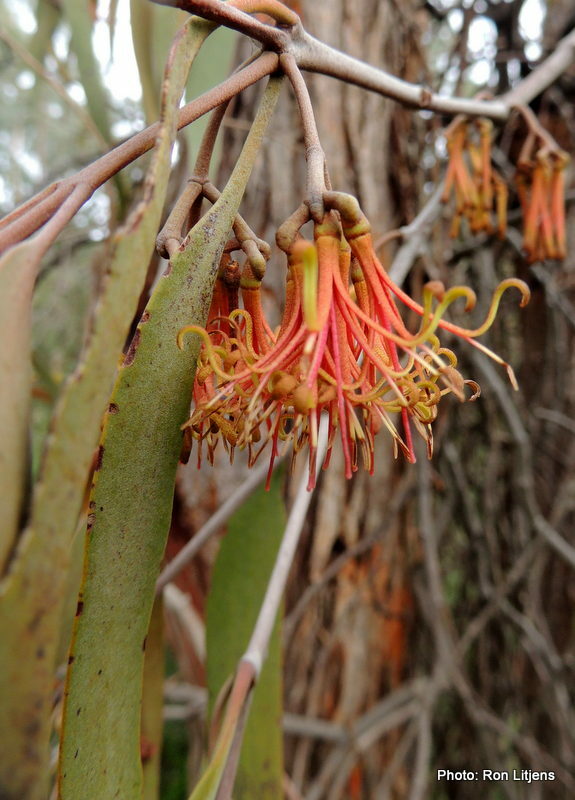 Mistletoes are often seen in the bush hanging in large clumps (of a different colour green) from eucalypt trees. 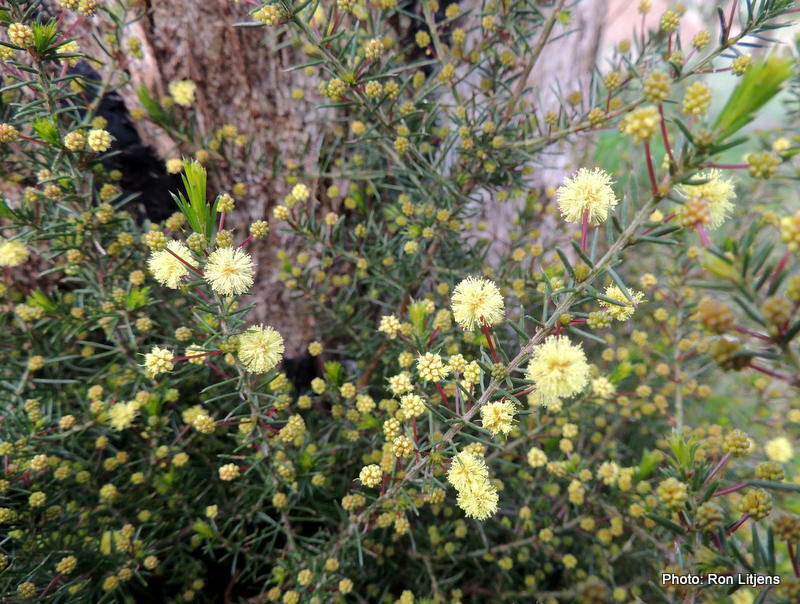 The plant is native to Australia, non-poisonous to humans and an important food source and nesting site for birds. The roots of the mistletoe are adapted to tapping into the host plant to obtain water and minerals. Given that the mistletoe derives some of its own sustenance through photosynthesis, it is regarded as only partially parasitic, or ‘hemiparasitic’. 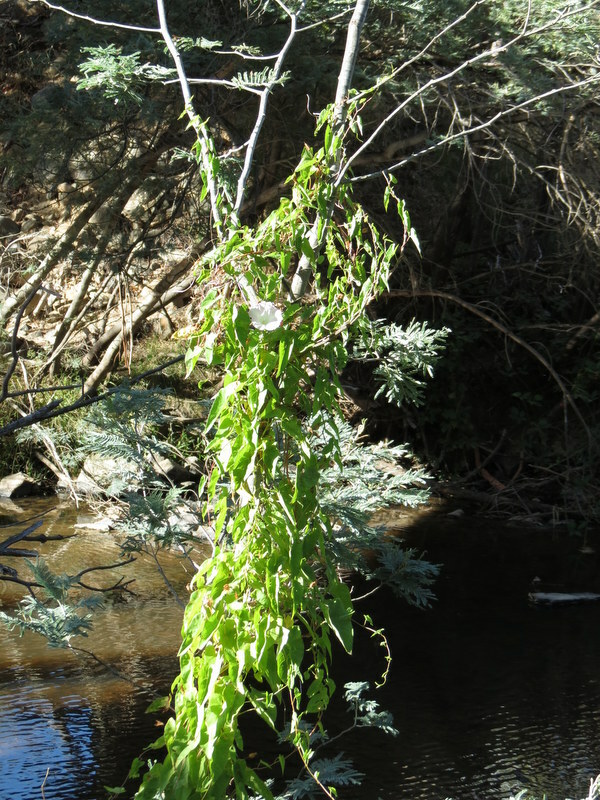 Sometimes the mistletoe root system totally takes over the water and mineral supplies of the host plant, resulting in that part of the plant beyond the mistletoe dying (see photo right). Birds such as the Mistletoebird (Dicaeum hirundinaceum), discussed previously, are important for the plant’s propagation. Such birds eat the mistletoe berries and quickly digest the fruit, then pass the seed out the other end. The seed has a sticky coating that adheres to plants when it has gone through the bird’s gut. It germinates within a few days and the roots begin to penetrate the host plant. In Europe the mistletoe is a symbol of fertility – because often in winter it is the only leaved plant in a deciduous forest. The tradition is that kissing under such a plant transfers that fertility to the kissees. It is lucky we don’t follow that tradition around here. With so much mistletoe around I’d never get any work done.